All the discussion about the H and C has got me curious: what is the anticipated final frequency of trains in the peaks on each of the district line branches and circle post full signalling upgrade and S stock introduction? Given the mammoth amount of data now available on individual travel patterns, this could be a great opportunity to do some proper modelling and reworking of current patterns to benefit the most people backed by real data. There will certainly be far more possibilities. It depends how creative the powers-that-be are! I'm assuming that's just the Met services? Although you can't run every 20 mins and run 4 trains per hour as far as I can tell. Interesting that after the upgrade, Circle and H&C peak frequency will be the same as it was 25 years ago! indeed, getting older i can't add-up ! and yes, MET only as Chiltern doesn't run to 'the city'. whilst the post upgrades look great. Is there any info regarding off peak frequencies? Will the met regain any fast trains off peak post upgrade? Will the Chiltern service run every 30min/2tph to balance the Chesham trains, combining south of C&L to run every 15mins/4tph which will nicely mesh with the Amersham (Met) trains? Chiltern already run 4tph during the morning peak, 2 of which are non-stop after Amersham, I don't think (at least hope not) that'll be reduced. These run alongside the existing 4tph Met service from Amersham. I'm not sure why the recent public timetables summary page have cited only a 2tph Amersham-Aldgate peak service, possibly the 2 semi-fasts are not counted because you can catch a later Chiltern to get into London sooner. I wonder if the new timetable will have a better clockface timing with a true 15 minute interval between Met trains, and I really hope the fasts are retained. The current morning Amersham Met peak service is improved from a few years ago though when the Chesham shuttle was running and there was only a 4tph Met service south of Chalfont - and with 2 Chesham through trains taking 2 of those slots in the 7am-8am hour, it left only 2 Met trains southbound from Amersham during that peak hour. A bizarre situation making the Amersham Met off-peak service double that of the peak. Now at least it's a combined 6tph Met service south of Chalfont throughout the peak. I too wonder what the off peak service frequency will be like. I hope this isn't the end-game here, it isn't very ambitious, and as others have commented, is comparable or inferior to levels of service 40-50 years back. Granted, however, dwell times and hence running times are very different now. Anyone else see a massive deficiency with Wimbledon service? 16tph will mean it gets less than Uxbridge (including the pic). Maybe another 8tph Wimbledon - HSK could be added. There was a quote a few years ago (can’t remember who) which was made after the Central line upgrade had been finished. Yes, I agree re Wimbledon branch deficiency. Most commuters on this branch wish to head on the lower portion of the District into central London and 'the City'. The potential changes actually take a train away from this avenue: 8tph vs current 9tph. However, the more even spacing may mean most people will not notice. At present two 'City' services follow three minutes apart and then there is a larger gap of eight to ten minutes. So, while nine trains an hour, the spacing is currently uneven. The even frequency hopefully will encourage more people to take an Edgeware Road train and change at Earls Court. While the trains from Richmond and Ealing Broadway reach Earls Court more lightly loaded than the City-bound trains from Wimbledon each morning, sometimes the current working timetable doesn't encourage passengers to 'always take the next train to Earls Court'. For example, train 72 and train 65 leaving Wimbledon just before 7:30am: passengers alighting at Earls Court from train 72 find the next City-bound train (train 65) is often too packed to board at Earls Court and were better off waiting at their local station for train 65, which follows 3 minutes later from Wimbledon. The ideal solution for the Wimbledon branch woes may be more 'City' trains at the expense of Edgeware Road/HSK trains. However, the logistics at Earls Court of sending trains from platform 4 to Ealing Broadway or Richmond seem complex. Crossrail may help to balance the loads a little more equally if the change at Paddington to the Elizabeth line is not too lengthy. This may allow passengers from the Wimbledon branch to get to the City (Liverpool St) and Canary Wharf quicker than current options. Quite possibly so yes. 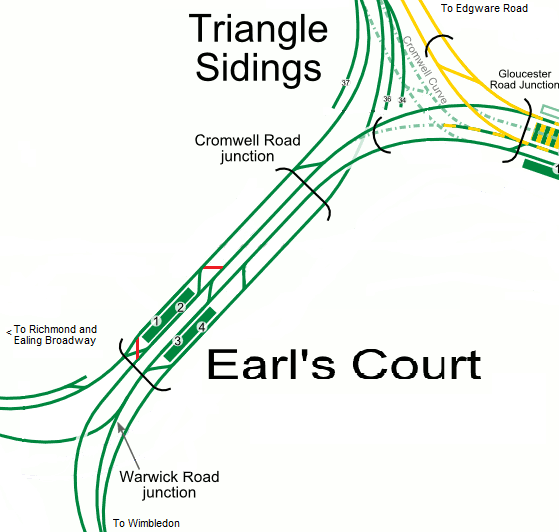 The trouble with Earls Court, as has been alluded to on this forum over the years is that as this diagram shows cdn.londonreconnections.com/2013/Earls-Court-Modified.png the non-conflicting moves are non-mirrored; Ealing-HSK, HSK-Wimbledon, Wimbledon-City, City-Ealing. A timetable with a natural bias towards that service pattern might be able to increase throughput beyond 16tph per track. Then again it is surprising it is challenging without service pattern changes. What was the District managing in the 60s before 8car trains were abolished through EC?